In the event of my death, let this document stand before man and God as my true and accurate testimony: in the hope that no man will ever again be abused, dismissed, abandoned, and retaliated against in Disaster Recovery, simply because he/she is different and has special needs. This COMPLAINT is filed against NYRising, NYRising Community Reconstruction Program, NYRising Buyout and Acquisition Programs, NYRecreate, The Office of Storm Recovery, The Housing Trust Fund Corporation (HTFC) and New York State Homes and Community Renewal (NYS HCR) and its Office of Community Renewal. This is my documented Record of egregious conduct and Intent by all of the above named parties, directly and indirectly, to Harm me, Limit me (and my heirs) Impede and Prevent me in pursuing my legal Rights; and Deny me Due Process; and of Acts and Actions by the aforementioned parties, their Directors, Counsel, Contractors, Consultants and Agents, to deliberately, with collusion and forethought, to Deny me my NYRising/NYRecreate Program and Constitutional Rights; to Deny me Due Process; to Interfere with Due Process; to Act in Bad Faith; to Manipulate me in Program Process, Procedure and Appeal; to Misrepresent, Manipulate, Abort and Deny my Right to and/or Outcome of Appeal; TO ATTEMPT TO BREACH MY VERIFIED ACQUISITION CONTRACT OF SALE, USING THREATS, HARASSMENT, COERCION, UNDUE INFLUENCE; withholding information; entering into a Bad Faith Contract of Sale; Breach of the Implied Covenant of Good Faith and Fair Dealing. And to Discriminate against me on the basis of my Disability; Discriminate against me By Association; Refusal to Provide Reasonable Accommodation in Programs and Services; continuous Denial of Responsibility to Implement Federal Disability/ADA/Accessibility Statutes, Standards and Requirements; Compelling me to Submit to an “Access Inspection” of my gutted, Substantially Damaged house by four Contractors (by their own report) with absolutely no qualifications in Access, Barrier Removal, Disabled Renovation, ADA Statutes, Federal Access Technical Requirements; and Retaliation because I pursued my Right to be treated like a Disabled Individual in Programs and Services and requested that the Programs and Process comply with Federal Disability Statutes. I was held to a different standard because of my Disability and because I requested Federal Statute Protections, and judged by a different Standard in Program Implementation, specifically in the Appeal Process and the documents I was required to submit: Subjectively, Judgmentally, with Bias, by Program Directors. I was told that the Appeal Board evaluated the Certified Letter and Retroactive Independent Appraisal in increasing the Acquisition Offer amount (following submission to the Appeal Board of the Certified Letter and Retroactive Independent Appraisal). There were no other intervening factors. However, the entire amount increased by the Appeal Board following their consideration of my Access Documents, is now under threat of being arbitrarily withdrawn. I hold a verified NYS Acquisition Contract of Sale dated October 3, 2014 with a Closing date stipulated to be November 2, 2014 and a purchase Price of $XXXX. NYRecreate refused to Close on schedule, even though I have consistently notified them over the last year that there was an urgent medical need for closure. NYRising/NYRecreate is attempting (3 1/2 months after the Contract of Sale was vetted and verified by two New York State Boards, signed by New York State) to Breach that Contract of Sale and reduce the sale price determined by the Appeal Board in Albany after completion of a lengthy Appeal Process (during which I was required to have written by professionals several reports not required of any other applicants), to reduce the Contract of Sale amount by $45,000 by threatening to throw me out of the Acquisition Program without cause if I do not immediately sign an Amendment terminating my right to execution of the existing legal Contract of Sale: I am being forced into signing papers to modify my Contract of Sale by threats, undue influence, and against my will, and forced to make statements that these coerced actions are voluntary when in fact they are not. In the event I am forced to sign a Contract Amendment or any other paper Under Duress, I state here that I did not sign voluntarily, without being terrorized, threatened, harassed and coerced, for a prolonged period of time and slandered repeatedly to those who tried to help me, by Directors of NYRising/NYRecreate, threatened with homelessness, bodily harm because of my medical condition, by being thrown out of the Acquisition Program without cause. I do not give up my legal rights, my liberty, nor do I agree to any limitations placed upon me by threat, coercion and duress. I do not agree to any change in my legal verified Contract of Sale or give up my right to have the original Contract executed as it was written and signed by me in good faith of my own volition on October 3, 2014. All aforementioned parties are responsible directly or indirectly for the bad faith actions, threats, coercion and extreme duress, and Denial of and Manipulation of my Right to Due Process in the NYRising/NYRecreate Programs and specifically in the Appeal Process, and in execution of my verified Contract of Sale, personal injury and for placing me in medical jeopardy. I affirm that directly because of and inclusive of the above noted acts and actions, I sustained significant financial, emotional and physical harm. I hold these statements to be true and accurate. You can only push people who are being oppressed by an unreasonable aggressor so far. Then, they either retreat or fight back. We fight back with the means closest to our nature: some resort to violence, I resort to words and the law. That does not necessarily mean lawyers: who often operate by negotiating compromise. Sometimes the only way to follow the letter of the law, is to seek it yourself: with knowledge, respect and perseverance. I had a NYRecreate Closing on my Substantially Damaged house on Tuesday, February 17, 2015. It was a forced proceeding, not a voluntary one. I had been relentlessly threatened since December 14, 2014, with daily deadlines of being thrown out of the NYRising Program if I did not comply immediately with demands for them to Breach the signed and verified New York State Contract of Sale on my house and me take a reduction of $45,000 in the purchase price. On December 15, 2014, I got a phone call from my caseworker saying there was a Closing on my house the next morning. I was shocked. When I refused to sign papers terminating all my legal rights to Due Process, to executing my legal Contract of Sale, she began threatening me. I was crying. She claimed that I had signed a “Rider” that they could cancel my Contract of Sale at any time without cause. It never happened! I told her to send it to me, along with an email stating all she just now told me. She said she would do no such thing, that I was only entitled to the paper she sent my lawyer. I told her that paper said nothing. I spent the rest of of December and all of January trying to get help, to stop NYRecreate from illegally Breaching my Contract of Sale, verified and signed by two N.Y.S. Review Boards. I went to private Contract Attorneys, who said I had no money; the Attorney General, who said he is NYRising’s Attorney so a conflict of interest; Law School Clinics, that said it is over their head; the ACLU, that said it is absolutely illegal for the State to Breach my Contract; Assemblymen and Senators, who said they work for the Governor and would not oppose his program; and many state and federal agencies, that told me nobody has any jurisdiction over NYRising or the Governor. I was told I exhausted all internal Appeals at NYRising and would have to take the case to court. The media offered publicity, too late. By January, I was under a gag order, or NYRising would walk away. I contacted the office of Darryl Towns dozens of times and Governor Cuomo hundreds of times with urgent pleas, right up until the last day. Darryl Towns’ office told me he had nothing to do with NYRising, repeatedly. I said his name is on the Cover Sheet for these Programs. By January, I was told if I signed a Rider accepting the reduction in price and stating that I “was not doing this under duress,” I would be given an immediate Closing. I was told I had no alternatives. I believed it, because no one would help me, NYRising had villainized me so! I was paying a hotel bill since April with borrowed funds. I had no money left, and the hotel wanted its money now. My physical condition had deteriorated without my needed medical equipment, probably to the point of no return. I was living packed in ice for the spinal pain and swelling for two years. I had multiple life-threatening consequences. I had no options: no hope! I was being demonized and vilified at every turn by Jon Kaiman. I spent the weeks leading up to the Closing weeping constantly, withdrawn even from my family. I was ashamed of myself for giving up, that NYRecreate had made a fool of me by pretending an Appeal that never had any chance of outcome because they had capped the Appraisal price before the Appeal began: that they were making me lie on legal documents that I was not being coerced. I could not stand the injustice. I went to the beach and screamed into the sea until I was hoarse. I was exhausted: shabby, bedraggled, lost and alone. I could not be perceived as weak: after all I was already disabled, homeless and destitute from Sandy. I must be strong! I knew beyond a doubt that NYRising would rather see me dead than HOME. I thought often during that period of killing myself. It would be so easy not to go on . . . I was so tired. But, then, I would go to Hell, and I would have to meet the demons from NYRising all over again. I was too angry to give these ogres the satisfaction of Closing my case so easily: one more notch in their belts. But, it was a snowy frigid morning, and my electric wheelchair bogged down through 6 inches of snow all the way to my car. The wheelchair skidded out of control up the ramp. Someone cut me off on the road and the wheelchair footplate went through the slots in the lift. So, when I tried to open the ramp, it jammed closed. There was no place for me to park at NYRising, so I had to park horizontal in three vertical spaces. My paperwork cascaded down the side of the lift into the snow and fell under the car. And there is no automatic door at NYRising, lobby or office. So, by the time I got into the Closing room, I was impacted by the challenges of my environment, intimidated by how crisp and impersonal everything was in that room, and aware that not one single person from NYRising was present. They had done the deed! I had already signed the paper saying I was not signing under duress, signed it under threat, two weeks before, because they would not request a check without it. But they immediately broke the promise of an immediate Closing and left me in arrears at the hotel. The first thing the lawyer for NYRising said in this room was, she has to sign everything seven times. Shocked, I exclaimed, I have to sign twelve papers seven times! It’s not going to happen!” (I have paralysis in my arms as well as my legs, and since I lost my equipment, I lost grip in both of my hands.) There was a woman from the title company, a lawyer for the State, and my lawyer present. I spoke to no one but my attorney, did what I was told, and was handed a check that he looked at briefly and all had agreed would be a Bank Check. I quickly put the check away. I just wanted to get to the bank. As I exited the conference room, there were two couples sitting right outside the door in the waiting room. They looked shabby and bedraggled, with mismatched rumpled clothes, clutching papers. Their faces were frozen between shock, depression, and destitution. They stared at the floor. One man looked up at me, imploringly. I mouthed, “God bless.” I saw myself. I told the bank manager I needed a check for this month’s hotel. She said, “This is not a Bank Check. I looked at the check: written on it was the name of the Title Company, an Insurance Company, and a bank. This check would take a minimum of nine business days to clear and could be stopped at any time by each party. I had clearly stipulated to NYRising, “You get my deed, I walk out with a Bank Check.” All agreed it would be so. My bank told me not to deposit the check, to go back to NYRising and they could take it to their bank and turn it into a Bank Check or Wire Transfer before 3 p.m. It was a simple matter. I was not concerned. I drove back to the Melville NYRising’s office. By this time, the pain in my spine was excruciating. I was very dizzy. I needed to lie down. “Then may I see the Supervisor.” I said. “I think they are all gone,” was the reply. I said, “It’s only 1:45. Please call someone. They gave me the wrong check and I need someone to fix it. I have to pay my hotel today.” She said there was no one to call: no one who could help. I quietly said, “Then call the police.” I was just matching her flip attitude. I did not think it would be a problem. After all, I had a written agreement for the check. I noticed she looked over at the guard in the hallway. Immediately, he came into the waiting room. He never left! I wondered if he had a gun. He never took his eyes off me. I was scared because they told me in the Seaford office they had to bring armed guards in to handle angry Sandy people. The receptionist went inside the privacy doors and no one exited for 55 minutes. It was stiflingly hot in the waiting room. I felt faint. Finally, at 2:40 p.m., a thin man, the Director of Operations, and a Supervisor, walked out the door to me. The woman avoided eye contact and spoke not a word. Obviously, she was there to witness. He was a smug, smirking arrogant man, reeking of attitude, a stone NYRising wall. I explained that this check was given to me in error. “Here.” I put the folded check on the counter. I need someone to rectify this. I felt my face swelling from the pain. I knew I must be all red. I hated that! He said in a slow patronizing droll, “So, you believe you had an agreement,” It was not a question, but a Rogerian statement. I said, “No, I said you are talking to me like I am a moron. You are talking like you are stupid. We both know you are not stupid and that you know exactly what is going on.” He smothered a giggle. He was getting the reaction he solicited. “I said, “I am not talking to you. I will talk to her.” He turned and went to walk back through the privacy door. I said, “Where are you going?” because the Supervisor did not speak. He said, “Was that written down?” “Where is it written down?” “Do you have a copy in writing on you?” “Someone said it?” “There are many State attorneys.” “Exactly who do you think said that?” “Do you have a name?” “What is that name?”. And on, and on . . . He was playing with me like a cat with a dead mouse. I told him that my bank said all NYRising has to do is take this to their bank and issue a Bank Check or a Wire Transfer. He was bobbing back and forth in my face like a cheap carnival doll on the dashboard, tight square mouth, twitching upward into a self assured smirk at my responses. I saw a Program gone awry: Sandy victims further away from home than they were on the day the hurricane hit. The room was full of malice: I was suffocating from the rancor. “You have a check,” he said, dismissing me. “That’s what you say. You think you had an agreement.” He hummed softly, hammering every word into a slow sing-song voice. My lawyer was on the phone. He explained they were saying I had to take this check because I accepted it. I said, “We had an agreement!” That was all that mattered to me at this moment. My head was bloodied from hitting brick walls for 28 months, and dealing with awful people following scripts from the devil. I was done with governmental irrational decrees protected by immunity from an almighty intangible force accountable to terrestrial particles. Enough! My lawyer said there was nothing he could do: they would not budge. He said it would take longer to get the check replaced than to clear it, because the State “believes” I took the check and made a copy of it and cashed it, so they have to wait until it clears. I was incredulous at these fiends making up more stories about me: putrid people puking on my life. I told him the name of who I went to at my bank, explaining the State could ask her if I cashed it. I explained, the check is in my hand unsigned: how did I cash it. They were accusing me of a serious crime!Jon Kaiman flashed through my mind with all his idiotic accusations against me that kept me isolated from any help from anyone: abandoned and alone by a shadow-of-doubt conspiracy designed by egomaniacs. I was hemorrhaging into the moment: wounded by new lies. I said aloud, “Well then, I will call the police.” and dialed my phone several times. For some reason, it kept dropping the call. get a call out. I said, My phone wont work. He smirked. “MY signal’s fine,” I wanted to rip his face off and see if there was anything behind it. I went into the lobby and made an emergency call. Just before the police arrived, the dispatcher called and asked me to meet him in the parking lot. The policeman was an ordinary man with absolutely no reason to be considerate to me. Yet he was extremely kind, and listened carefully with respect as I explained how I returned with an improperly issued check in plenty of time for them to replace it today, but they ignored me and delayed, then told me there was nothing anyone can do about the check: that I must accept it, there is no recourse, badgering me with a pointless sing-song theatrical charade. I was crying. I told him I just wanted to file a formal complaint. He took my report, looked at the check, and asked me if I had paperwork to prove there was a process involved, to protect myself. He said they could not take back the money, although I did not ask him that. He said he would go inside with me and try to get a replacement check. But, I told him they said everyone is gone and the checks are issued in Staten Island, and I think the lawyers are trying to work it out. He said if I had to come back tomorrow, to call him and he will accompany me into the NYRising office to make sure they give me no problem. Then I told him how NYRising deliberately led me through a Fraudulent Appeal Process for 6 months that never had any possibility of outcome, and that they slandered me unmercifully so that no one would help me. I was weeping with the memory. He asked if I was going to follow through on the fraud. He said if there was anything at all he could do, to call him, and gave me the Police Report Number. I explained how many thousands of people are still homeless and suffering: and that NYRising is hurting so many people. He said he knew many stories related to NYRising. He asked if I was going right home. I knew my face was red from the pain and he was concerned. We had talked for over an hour, and we parted shaking hands: he to his squad car, me to re-enter the building for a timeline. She went inside. I started to leave. The awful man walked through the privacy door with a small pink post-it in his hand. He said several times that my lawyer’s office was trying to contact me: please call them. He thought the matter was resolved: all the lawyers are talking; he has nothing to do with this; he knows nothing, but the situation looks good. He sat down quietly beside me and started chatting pleasantly. I stared at his face. He was not smirking now. He opened the doors for me as I left, and walked me to my car on the other side of the parking lot in the snow, to make sure I got in. It was very cold and he had no coat on. He said it was very nice to meet me and wished me luck now that I had money. I told him calmly that the check did me no good: it was not enough; they took back $45,000 (the access money awarded by the Appeal Board) at the last minute or they would not Close on my house; I can not get an accessible home with this, or modify an existing home to be accessible in this geographical area. I can not rent, because nobody would let me modify their property for my needs. There was no resolution for me . . . I closed the lift and he was gone. The next morning I returned to the NYRising office in Melville expecting who knows what, unsure if I should call the Police Officer to come before, as he suggested, or after, trouble. A lawyer who helped me into the office the day before, came running out to open the heavy glass doors. I was in the waiting room from yesterday, surrounded by ugly memories. He watched me in the empty room, wondering what I was doing here again. She slapped a paper down on the chin-high counter next to me and asked me if I had a pen. She made me sign, a picture of the first check on it: written on the paper was, “I received.” It didn’t make sense to me that I should sign this, unless she signed it too, because I was not receiving the old check but the new. We exchanged checks. I asked her name as she ran back through the door. She said her first name and I knew she was the State’s attorney. You do not walk away from abuse like NYRising has intentionally inflicted on homeless Sandy Survivors, dehumanizing and disrespecting people to control them, people who have lost everything through no fault of their own, and are vulnerable. You endure it. You struggle through it, because you have no choice. But it will always be imbedded in your flesh: part of the fabric of your life: an indelible imprint of the great natural event that tore your life apart and left you at the mercy of massive governmental recovery system failure. In this season of joy and good will, there are thousands of Survivors of SuperStorm Sandy peppered throughout your communities: who are suffering, cold, hungry, many living in gutted, moldy houses because Housing Programs ran out, with children, sick, disabled dying, waiting too long. Sandy Survivors are isolated on the fringes of a society in denial, glad it was not them who lost everything to the terrible flooding, sewage and slime on October 29, 2012. Sandy Survivors have been drained, financially and emotionally, by failed U.S. Disaster Recovery systems ill-prepared for major disaster, discriminating against Sandy Victims because of abuses they claim Katrina victims committed. Sandy Survivors are being tormented, forsaken, by inept Repair/Renovation Programs, like New York State’s failed NYRising Program: limping along, put out to bid almost two years into the disaster, reorganizing and floundering midstream. NYRising Victims working diligently to get home, are pummeled by inaction, delaying tactics, manipulation of facts, constant lost paperwork, unanswered communications, favoritism, and total abandonment of desperate homeowners. NYRising’s Program was hastily implemented, before it was designed, and is continually, erratically changing rules, increasing requirements, decreasing grants, back-sliding, to the extreme detriment of displaced homeowners. I beg you, the public, to look into the eyes of your community, recognize your neighbor’s who lost everything through no fault of their own: reach out to them with kindness, support empathy and good will. There but for a few degrees on a map, goes YOU! ALL WE WANT TO DO IS GO HOME! There is a beauty in losing everything, in being destitute in a world of plenty, in a world of things. When you have lost everything you struggled and sacrificed for all of your life, rather than a void to be filled, there is a crystalline strength in you to be accessed. You see clearly. You feel, untethered. You know truth, You fear nothing. Possibility is unlimited. Nothing worse can happen to me. I have nothing left to lose. Nobody can hurt me more. That is very liberating, and sad. I tell no lies. The agency of the United States Department of Homeland Security, called FEMA, is out-dated, and out of control. It needs to be investigated and held accountable for its actions and mistakes, re-thought, re-structured, re-designed. FEMA has become a pale shadow of its original intent, which was to coordinate response to a U.S. disaster that overwhelms local and state resources. Present day FEMA runs rampant over people and circumstances, wrecking havoc on good and honest men, making a disastrous event into a human relations nightmare, an avenue to destitution and bankruptcy. FEMA treats people with callous disrespect, and gives them outrageous token assistance that is much more a hindrance to recovery than a help. People walk away from their homes, because they are being offered nothing: no help, assistance, options, no hope. People walk away from FEMA disrespected and bleeding. I watch broken peers walk into the surf, shoved from shelter, with no place left to lie down, and I am diminished. The problem is not the resources of FEMA or its limitations, it is the attitude, training, process, procedure and accepted outcome. FEMA gives people only the ability to walk away from their homes, or paste together disorder and destruction, in the name of restoration: to become an unlivable sinkhole when FEMA is safely removed, working on its next disaster. FEMA is hindrance: negative help, professional bullies. This is the country I love. I wish I could say something more positive about their effort to manage disastrous events. But, the only productive way to interact with FEMA is to point out their glaring failures, and hope that someone will respond with critical analysis and action. It is time to stop limping off alone and licking our wounds. We must stand up together and acknowledge how much damage FEMA does, for change to happen. There is momentum in truth, to action. I am not afraid of FEMA. I lost everything. Then, FEMA destroyed all of the intangibles I had left. I join a crowd of people who have been hurt, not helped by FEMA. Perhaps we are irreparably hurt. Perhaps we can recover, despite FEMA. Constant excruciating pain is my reality, from loss of $50,000 in medical equipment during SuperStorm Sandy over 21 months ago. It is August, and with damaged temperature control due to severe autonomic dysfunction from SCI, I am at extreme hazard in hot humid weather. I am living in a hotel room: not home. When I need to go out in my electric wheelchair, I must take supplies stored in my wheelchair van out, and put them in the hotel room. When someone is coming to visit me, I must put those items back into the van. This is time-consuming and difficult: a small price to pay for a place to be. My electric wheelchair must be kept in the hotel room, because the battery discharges quickly in the elements. My garage drowned. So, when I need to go out, I must charge my wheelchair and move it through the narrow hotel room door, out into my Rampvan. Invariably the chair veers out of control when I gun it to get over the marble threshold, and I gash the door. I touch up the white metal surface with a paint pen before I leave, and usually again when I return. Before I leave, I place orange cones in two parking spaces, hoping that no one will move them and claim the spaces.before I get back, or take the cones home once more. I hope my key card does not turn red when I return, because I cannot get to the office in the wheelchair. Pulling out of the parking space, I know for sure that I will never ever be as comfortable or secure as I was on October 28, 2012, making 100 meatballs to freeze for Christmas buffet in my warm, fragrant kitchen. And I know that nobody gets it, or cares! All this is only relevant to illustrate that it is not simple for me to go out into the world, living in a hotel room without what I need to function with SCI. The systems are harsh, inflexible, and irrationally judgmental.. They circulate paperwork that I am “difficult,” “hard to please,” and “uncooperative” if I voice what I require. In the horrific world of Disaster Programs and Agencies, different needs translate to a person who is “uncooperative.” If you hold up the line, they make you pay for it! I am in my van heading for NYRecreate in Farmingdale to deliver the Independent Appraisal I am required to submit to Appeal my Acquisition Offer. I breathe a long deep sigh of relief that I made it this far, and I want to go home. But, home is gone! Comfort is gone! Security is gone! There is cement all around me. I follow the line of a faux stone wall to Sunrise Highway, easing very slowly down the parking lot exit ramp so that my Rampvan does not bottom out. I remember my birthday six weeks after I got my van. My birthday present was a sidewalk the width of my yard, and a ramp from the street to my driveway, because my Rampvan was totally unable to enter or exit my own property. I was so happy and grateful for that ramp, and all the structural access modifications that were installed in my house and property. That was my norm. I was not different there. I was accepted for what I am. I am crying now, driving. I cry every time I venture into my post Sandy world. There is barbed wire everywhere, walling me off from people who did not live through Sandy, walling me in to failing Programs and Agencies spewing incompetence and fraud, slashing me as I try to move forward, binding me to the rubble of yesterday, piercing hope. When I am inside the hotel room, I have very little that is mine. But I also have no visuals of the world I knew. When I go out, and I see familiar places, it cuts me deep with what I lost. When I go to a store, everywhere, I see what I need, what I lost. When I see people driving to a destination, I know that I have none. No matter where I go, I do not really belong: I do not want to be there. I wander alone with a pinpoint focus on home, in a world that went on without me and forgot who I was. I must create what I need, from nothing. I am filled with panic, fear and hopelessness, choking down silent screams: alone in a world of strangers and things. I drive east on Sunrise Highway and turn north on Route 110, noticing that all the traffic lights are off. I wonder if there is no electric in all of these houses and businesses. How vulnerable we can all become in a moment. I wonder why the electric is off. I maneuver around police cars with flashing lights, snarled traffic, and irate drivers. I am not impacted by them: life crises seem so trivial now. As I pull up to the NYRecreate Office building, I notice the windows look dim. I surmise their electric is off also, and hope the combination lock is working. I am wondering why my new caseworker did not answer my calls this morning telling her I was coming. I am thinking about the fact that the NYRecreate’s Offices are not accessible to anyone in a wheelchair. The main entrance of the building is open to all. But people using wheelchairs must request, if they can get through to anyone, to go through a heavy metal door on the side of the building that has a keypad combination lock: so illegal. They don’t get it! I called my new caseworker for a third time, and listened to a message that said she would get right back to me. I had no general number for the NYRecreate Office. They always said call the 1-800 number. I parked in the illegal handicapped parking, with its three-foot access aisles, because I did not want to sit out in the sun in my wheelchair waiting until someone might come along and might let me into the building. I figured I would watch from the car to see if someone came back from lunch. I always park on the other side of the complex in the van spaces by the child care, far away from here, just so I can get out of my car with the electric wheelchair. Last year, I came to deliver papers. I had never been given a phone number. I sat in my wheelchair for one hour in the freezing rain outside the combination door, knocking on the windows of the conference rooms, trying to get someone to notice and open the door. After an hour, shivering, I was finally let in by someone returning from lunch. I asked if he could get me through that door, because I had to deliver this paper. He said he surely would do that. I began the process of getting the wheelchair out of the car. I first had to park sideways in three parking spaces so I could get back into my car. He was very patient and friendly, and there was absolutely no one within eye-shot: but I was oddly not afraid, because I was focused on getting into that building. He punched the keypad: so easy when you know the numbers. He struggled to hold the heavy metal door open as it tried to swallow me. The small vestibule was crowded with boxes and the hall inside was strewn on all sides with empty boxes. I thought it was a mess. There were several men in suits standing and they asked the handyman what I was doing here. He explained that I wanted to deliver a paper to NYRecreate. They told him to take me to the front desk. I wondered why. The front desk turned out to be at the other end of the complex and I found myself grateful that I did not bring my broken electric wheelchair that only runs for 20 minutes. As we turned the corner, there were suddenly three people staring at me from behind a desk, like I had spaghetti on my head. I guess they were wondering how I got in. The kind handyman told them I came to give some papers to NYRecreate. He told me when I was ready to leave, to call him, and left me there by a stairs I could not descend, on the inside of a locked combination door. Barbed wire! I wondered why I had to come all the way back here to be told. Her words smashed against my weary head. I was confused, frustrated, angry. She said she was not kidding, and pointed to a sign on the wall. Everybody just stood there like I was the unreasonable one. But I wasn’t ready to accept that they were gone yet. They should be where they are supposed to be. “Do you have any idea how hard it was for me to get here?” I protested. They stared at me blankly. I rambled on about how my new caseworker did not answer my calls or emails, about how my former caseworker was so competent, and how NYRising was implemented before it was designed. I saw my words amble out the front door and down the stairs. I was standing there pointless. I asked the receptionist to write down the new location of NYRecreate. She copied the name address and phone number off the wall. She said they moved 4 miles north on 110. She said she wanted to call the new NYRecreate office to tell them I was coming to deliver the paper. But, she asked them if she could deliver the paper instead, on her lunch hour. I was shocked. I wanted to make sure it got there myself. It was important. But, I knew that when I got to the new building, I might not be able to get into it, given NYRisings’s lack of disabled access in the two offices I have used. And, I was wearing down from the pain. So, I accepted the receptionists unexpected offer, with gratitude and puzzlement. Why is there such rampant cruelty in the world, and random acts of unexpected kindness? As you are aware, FEMA stopped paying for my temporary housing, despite Stafford Act Protections for disabled individuals, on September 15, 2013, when they removed all able-bodied individuals from Hotels, ending the Temporary Housing Assistance Program. As you know, xxxxxxx xxxxx, your predecessor, repeatedly committed to keeping me at this hotel, renting this room under a Direct Lease Program, if the TSA Program ended, until I could return home. I had personal conversations with Xxxxxxx and Xxxxx xxxxxx on this: he designated a “team” specifically to work on my case. They were the only FEMA allowed to speak with me: he removed all my personal information from the system. I was not contacted again until xxxxxxx xxxxx was leaving FEMA in June 2013 for a job with a different agency. I am still in a hotel solely and exclusively because FEMA missed Substantial Damage in their Inspection of my house and gave me an unreasonable repair grant of $5,035 for my substantially damaged, and now toxic, house. You have read my medical files, documenting medical limitations and hazards: why I require special options and consideration in housing. Let us be clear, my home accommodated all my needs: my home is not available to me now! I am adjudicated permanently totally disabled for 36 years and the grave implications of my unusual condition are voluminously documented. Despite this information, FEMA removed me from Temporary Housing Assistance at the Best Western Hotel: and, against my will, forced me to the DHAP/HUD Program. DHAP/HUD claims I am not their responsibility: I am FEMA’s responsibility, repeatedly refusing to help me in any way whatsoever. 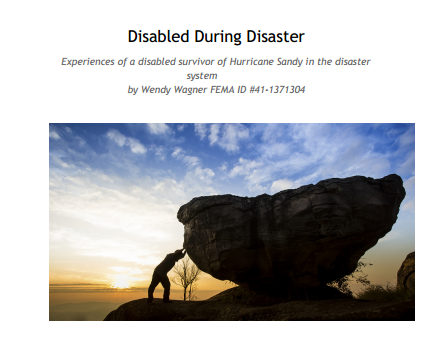 DHAP/HUD, like FEMA, is completely unprepared, unwilling and it would seem unable to deal with special needs, special circumstances, or disabled individuals: dismissing, denying, placing a whole class of people in terrifying jeopardy. I filed two housing Appeals: to FEMA. The first was filed exactly as FEMA Agents told me to do, on 12-29-12. It has been posted on the internet since 2012 and repeatedly discussed with FEMA. An Appeal was filed by my attorney on August 22, 2013: a 504 Request for Reasonable Accommodation. Neither Appeal was answered. After assuring me the proper people were working on it for months, FEMA finally told me of the first appeal, “We do not answer Appeals. A non-answer was received on the 504 Appeal, saying if I attended DHAP Orientation FEMA “might” consider it. I did so. There has been no response from FEMA. However, I was told that FEMA flipped the 504 responsibility over to HUD. HUD is ignoring me. -FEMA has extensive medical documentation that it is hazardous to my health to relocate me to an apartment. -I paid the hotel bill for the past seven weeks. I am out of money. -The Rental Assistance/Transient Accommodations grant issued on 11-30-12, in the amount of $4,695.34 (which I tried to return to FEMA Agents at Cedar Creek Park 4 times and was rejected with. “We know you have related expenses. That is your money.”) Was exhausted on Temporary Housing. You have that documentation in your hands. -I am participating in the BuyOut/Acquisition Program of NY Recreate. I was told several months ago that Resolution would take 2 to 6 months. I have no control of their timeline. The alternative to a BuyOut of my Substantially Damaged, Toxic house would be NY Rising Rebuild Program, which would be a hardship for me to begin after 14 months of futile repair attempts on a home that floated off its foundation and must now be bulldozed and elevated 12 feet. -I was told by your legal department through Mr. Xxxxxxxx, by Xxxxx Xxxxx and Xxxxx Xxxxxxxxxxx, that there is $8,600 in my FEMA file (because you miscalculated repairs on my totaled house), available to me, that can be used for housing and has been provided to others for this purpose. I request this money to pay my Hotel bill now, committed to and implemented by Xxxxxxx Xxxxx and his Disability Team as Reasonable Accommodation from January until June of 2013, when he left FEMA for employment at a different Agency. -I have sent Hotel receipts. I expect those bills (in excess of the initial $4,695.34 grant I exhausted at FEMA’s direction) to be reimbursed in a timely manner and my housing at the hotel to be paid from the $8600 withheld by FEMA on my totaled house, pending NY Recreate Buy Out. -Note: Under the Stafford Act you are not supposed to charge the disabled person for temporary housing. Please do not compound this horrific sequelae by again putting the blame on me, for still being in a hotel. I am here solely because FEMA failed to identify substantial damage, validate and deal with disability compliance, follow protocol, answer voluminous, properly directed complaints, or to act in a timely manner. I have been injured and scarred by FEMA’s lack of response. I am asking you now to demonstrate good faith: to cease and desist distributing outlandish letters with a litany of falsehoods to officials, falsehoods that can be expeditiously disproven. You have wasted so many people’s valuable time and effort with this frivolous, cavalier tactic. I am reluctant to believe that FEMA is that incompetent. When we make grave mistakes, it is most facilitative to admit them and try to mitigate the consequences in an equitable solution. Without a doubt, FEMA, DHAP//HUD are making a mockery of disability and literally killing disabled people, because they don’t know what to do with us. I have seen too many of my disabled friends die because of the way they were treated in this disaster system. Don’t make my beneficiaries litigate this case!! Be assured that I have tried, and will continue to attempt, to settle this matter amicably. Let us work together to rectify the devastating consequences that the Disaster systems have visited upon myself and the disabled community. Disabled people should have been the first population sent back home, not the last.